Instead of working on my youngest daughter's granny afghan this weekend I worked on a project I had in my head for a while. 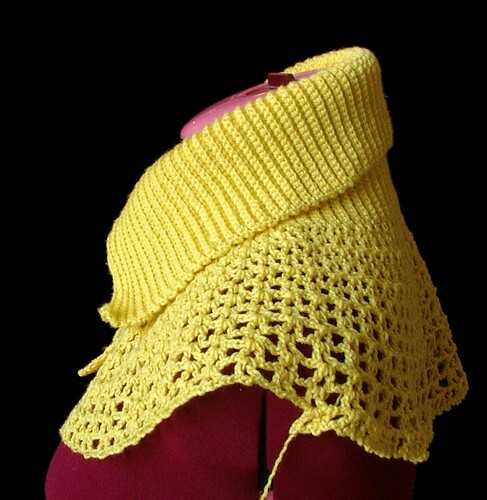 This is the start of a yellow caplet. I have worked the button holes already on the collar and top of the cape . 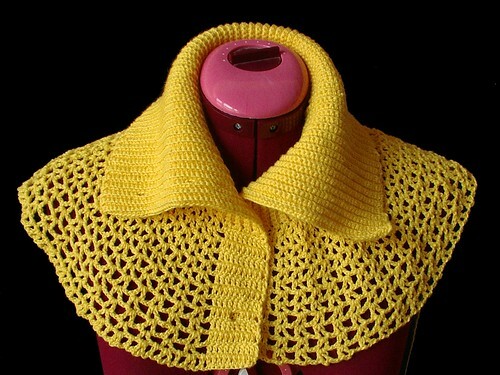 This can be worn as a turtle neck or open with lapels. I haven't decided on the buttons yet probably antique mother of pearl buttons. They have to be two different sizes but have the same look. As I have on purpose made the holes on the neck part smaller as to not cause a discomfort to the wearer. 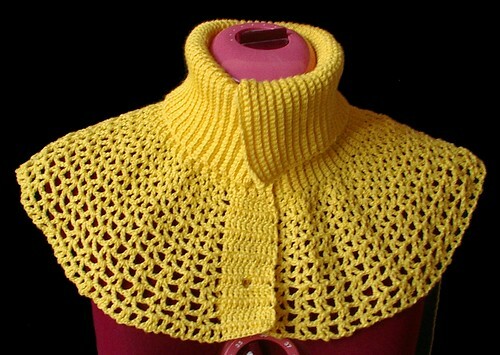 On the cape itself the holes are larger for a bolder look there but not to large as yellow is a strong color and I want it to take the most attention. So the buttons will be very plain. 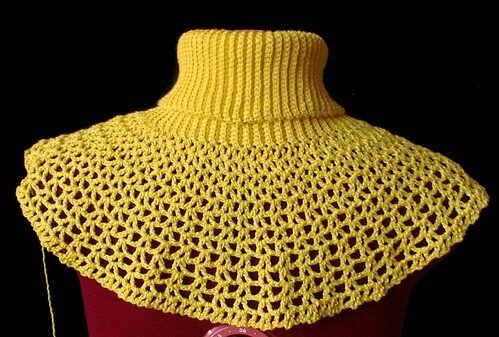 It is made out of the same vintage yellow cotton as the cloche and the daisy tam. I think I might have all the yellow gone after this but maybe not. I am trying to use the threads that have not been packed yet so I don't go digging through all the boxes in storage. Makes it interesting to try and make this and other project, but challenges are fun. Once again I am working from the pattern in my head and nothing is written down. Although that wouldn't be hard to do. I have given the piece a boarder around the edge, the button flap, and to continue the ribbing around the bottom too. I am planning on doing embroidery on this part but not sure yet if that will be to much I will wait and see and make that the final decision. It's gorgeous!! Are u planning to share the pattern?? Absolutely gorgeous. I nominated you for an award.